Spring begins with the weather! There’s official calendar Spring, and then there’s spring in the field, that ignores exact dates and goes by the weather, marking winter as over whenever the freezing temperatures end. 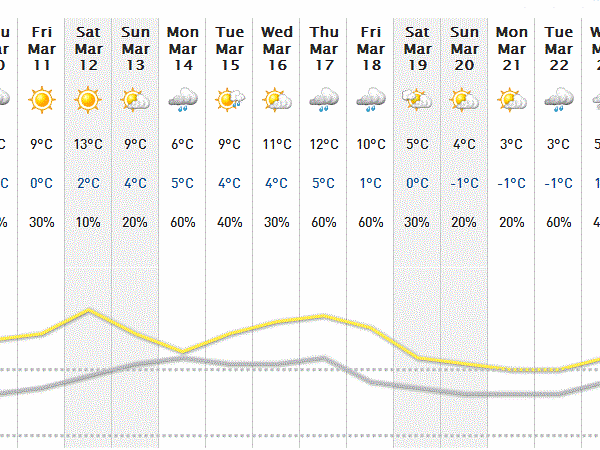 If today’s two-week weather forecast is anything to go by—it is, in this case, when being off by ±5-10°C (14-23°F) either way isn’t a big concern—market garden spring starts now. For the moment, I’m mainly concerned about overnight lows in the unheated greenhouse, and whether row cover is necessary. If it stays above -15-20°C, my safe-with-no-cover cutoff, it should be fine to pull back the covers and let the sun shine in (prepared, of course, to put it right back if there’s a sudden severe dip, which we hope doesn’t happen). Nothing complicated, just a little of the gambling that’s called working with the seasons!